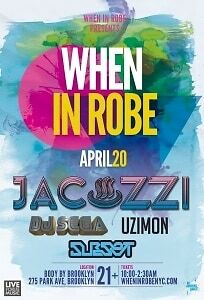 When In Robe returns on April 20th for a very special night at our famed spa. The night will feature DJ's Jacuzzi, straight from Hawaii, DJ SEGA, UZIMON, along with our incredible resident Subset and some more special surprises to be announced. If you're new to When In Robe, here's the run down: your ticket gets you access to their upscale spa, complete with a hot tub, steam rooms, saunas, a fully stocked bar, full lighting and sound, and some incredible DJs. They event present you a free glass of champagne when you enter and have free food throughout the night so you dont get the munchies. Hawaiian producer Jacuzzi has been making quite a name for himself, hitting #1 on Hype Machine with his remix of Santigold's Disparate Youth. His debut EP Mizu, released this past December, has received support Bassnectar, Pretty Lights, What So Not, Sinjin Hawke, and Madeon among others. DJ Sega has defined the genre of 'Philly Club' over the past few years, touring with the likes of Diplo and Buraka Som Systema around the world. His sample driven tracks and mixes breathe life into any party, mixing bouncing beats with a whole mess of fun. He's a veteran of the Mad Decent Block Party, where he will be performing once again this year. You kind of have to see Uzimon to believe him. This larger than life reggae star will be performing a brief live set throughout the night's festivities. He's a veteren of Webster Hall's BASSMENT and will probably take over the world at some point. Just check out this video to get an idea. Need tickets to When In Robe: A Spa Dance Party feat. Jacuzzi, DJ Sega, Uzimon, and Subset before they sell out? Grab tickets here!